This page discusses practical techniques for retrofitting motorcycle seats with magnetic field shielding alloy. I hold the first patents pending in various countries around the world for ELF EMF magnetic field shielding motorcycle seats. It's for those riders who recognize the concern. As shown in the photos below, RiderSaver™ EMF shielding is secured onto the interior seat pan, under the foam, during motorcycle seat construction. As explained in The Motorcycle Cancer Book, there are a variety of motorcycle generated electromagnetic radiations that can reach the rider's groin. Of most concern are current induced excessive ELF EMF magnetic fields which penetrate through all conventional metals. It is not within the scope of this section to discuss the penetrating nature and biological concerns of various ELF EMF exposures. Both The Motorcycle Cancer Book and website excerpts herein can provide further insight. It is extremely difficult to completely block or re-direct current induced ELF EMF magnetic fields. “Magnetically soft” alloys can achieve exceptional attenuation of ELF EMF magnetic fields, however, shielding results will vary for motorcycle seat retrofits due to different seat configurations and EMF orientations. Through extensive research and experimentation we feel RiderSaver™ shielding is the most outstanding pliable ELF EMF magnetic field shielding in the world. RiderSaver™ shielding provides exceptional attenuation (degree of shielding) for unique and irregular electromagnetic radiations induced from either current or voltage. RiderSaver™ shielding is corrode-free, can be cut and is generally pliable to accommodate intricate motorcycle seat internal base pans. RiderSaver™ shielding has a peel off layer for a stick-down side to further enhance installation onto seat pans. The outstanding magnetic field attenuation results from a unique heating/cooling process within a hydrogen reactive atmosphere. RiderSaver™ shielding is hydrogen annealed and isotropic meaning that it is ideal for attenuating EMF magnetic fields of varying orientation generated from either AC or DC electrical systems. Keep in mind, seat shielding cannot entirely remove the radiation and weaker fields are more difficult to attenuate than stronger fields. Using the most optimum ELF EMF magnetic field attenuating alloy and practical motorcycle seat shielding techniques, the goal is to reduce their excessive presence within the groin. A retrofit procedure for ELF EMF shielding motorcycle seats is posted below. It is easy to follow and simple to understand. 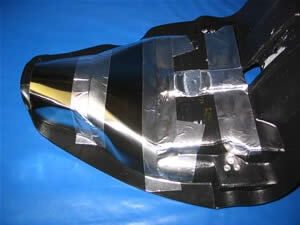 However, motorcycle seat retrofitting is not for your average "do it yourself" person. 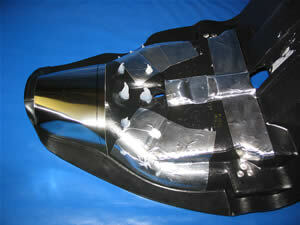 Existing seat retrofitting may or may not be a simple procedure depending upon your skill and type of motorcycle seat. Motorcycle seats can be intricate to work with. Basically, you don't want to make a mess of your seat whether its a new motorcycle seat, aftermarket motorcycle seat or custom motorcycle seat. Proper seat shield retrofitting requires a skilled craftsman in the upholstery or seat repair industry. PLEASE NOTE: Riders should not have to be out of pocket for my product or any other type of shielding to re-direct motorcycle magnetic field radiation. Excessive ELF EMF emission is a motorcycle industry problem regarding rider health safety. Some motorcycle ELF EMFs are extremely encompassing and ubiquitous as shown in my video. To completely eliminate rider exposure the motorcycle industry needs to address radiation emission during bike manufacturing to protect consumers. By signing The Motorcycle Cancer Risk Worldwide Petition we can encourage the motorcycle industry for safer vehicles. The area of concern corresponds to the groin of a seated motorcycle operator. 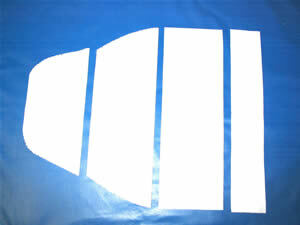 RiderSaver™ EMF shielding consists of a 5 foot roll of pliable adhesive alloy approximately 4 inches wide. The roll is suitable to cover the interior base pan of most motorcycle seats. Carefully dismantle an existing motorcycle seat to fully expose the seat's interior base pan. See PHOTO A. Simply cut and stick alloy panels to the pan corresponding to the rider operator's general groin area. 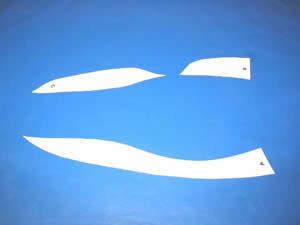 See PHOTO E.
Paper templates are to be cut first to determine proper segment shapes to ensure a snug and accurate fit. See PHOTOS B, C and J. The goal is to cover as much motorcycle seat pan area as possible however the alloy must be strategically cut to ensure sparing use as the alloy is expensive. See PHOTO D.
The alloy panels are to consist of approximately 1/2 inch seam overlaps. See PHOTO E.
Generally, plastic motorcycle seat pans do not adhere very well. 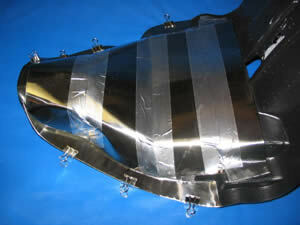 To compensate for this, aluminum duct tape segments are to be placed onto the pan in sparing strategic patterns corresponding to spots where the panels will contact and adhere to the surface. Standard aluminum duct tape provides a better stick surface for silicone adhesion also. See PHOTO F.
Riveting is an option only in areas where the alloy contact points sit flat on the motorcycle seat pan surface so as to not deform the alloy seams. Tiny dabs of silicone adhesive are to be sparingly placed onto the motorcycle seat pan surface before alloy application to ensure long-term adhesion. 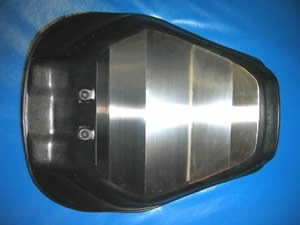 See PHOTO G.
For irregular motorcycle seat pan surfaces the alloy panels can be cut and placed in a manner to "curve over" the raised pan portions. The alloy is generally pliable and will basically take the form of the seat pan surface with some curving and shaping. See PHOTOS D and E.
For challenging motorcycle seat pan surfaces, paper templates are essential for planning alloy segments. A blob of silicone is to be placed in any "hollow pocket" to support the alloy from below. It is very important that adjacent seams overlap uniformly ensuring a continuous closed adhesive seam. See PHOTO E.
If the surface of the motorcycle seat pan is very irregular then the alloy can be strategically cut to create an alloy overlap onto itself to "flatten out" corners that would otherwise create unreasonably raised sections. Too many cuts in the alloy are not recommended and cuts are to be used only if absolutely necessary. On some motorcycle seats a "straight line slight bend" in the alloy can create a perfect fit for placement as presented in the following photo. Please note the seat shown is not finished as it still requires alloy placement around the sides. 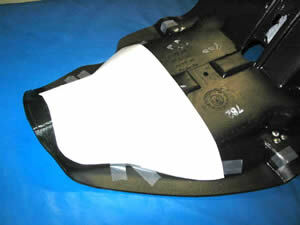 See PHOTO L.
Small "flat" chopper-style motorcycle seat pans can simply consist of a uniform flat adhesion. 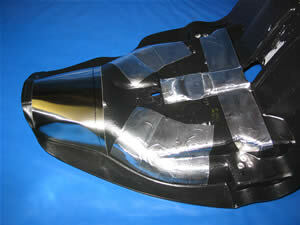 For small motorcycle seats any excess alloy can be doubled up in the groin area for extra coverage. For regular or standard motorcycle seat pans the concave or "curved down" shape of completed seat shielding assists in the attenuation. All alloy seams must be pressed down firmly to ensure that a complete shielded surface is achieved with no gaps, cracks or holes. Do not press too hard onto "hollow" areas to avoid any alloy bowing or deformation that may open a seam before the supporting silicone has cured. Any "small" pieces of alloy require a silicone dab to ensure adhesion. Slight overlaps around and under the perimeter edge of the motorcycle seat pan are not a problem but must be minimized as the alloy is expensive. 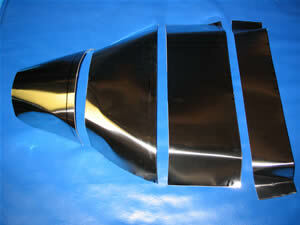 Any substantial horizontal motorcycle seat pan edge, wider than approximately 1/2 inch, should be covered also. Legal document metal clasps are perfect for holding the alloy in place while the silicone cures. See PHOTOS J and K.
Any newly created gaps between alloy panels would have to be addressed with small alloy patches, silicone and aluminum duct tape to ensure placement. All alloy seams and edges are to be entirely taped over with aluminum duct tape for snug alloy implementation, extra stability and seam integrity during silicone curing. See PHOTOS H and I. Heat of any kind must not be used in any way as it can affect the magnetic shielding properties of the alloy. When the silicone has cured, normal conventional motorcycle seat construction continues right over the implemented shield. Shorter staples may be necessary so as to not disturb the internal alloy. For example, if the motorcycle seat pan is about 1/8 inch thick then staples that are about 3/16 to 1/4 inch long would be sufficient however, a new staple pattern may be required for some motorcycle seats as staples will not pierce through the alloy. It is beneficial to note any "hollow" areas or corner pan ridges under the shield as these sections would be fine for stapling. Be careful not to let the stapling interfere with, disturb or lift the internal alloy. Each motorcycle seat is unique and a pre-plan strategy is an integral part of successful retrofitting. The foam and leather layers will completely conceal the electromagnetic shield. A few minor sections of the foam padding may have to be sliced off with a razor to accommodate a snug fit over the shield. Any rubber support plugs that were removed are now siliconed back into place. Some interior rubber nib insertions may have to be sliced off to ensure snug replacement. 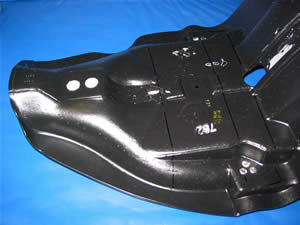 For new motorcycle seat construction the above procedure applies beginning with a new seat pan. RiderSaver™ is a trademark owned by Chipkar Health Concepts Limited and it pertains to EMF attenuation. Tags for this page are shielded motorcycle seats, leather motorcycle seats, motorcycle seat repairs, custom motorcycle seats, made, pads, repairs, covers, heat and magnetic field shielding materials.